The kitchen is one of the most important rooms in the home – it is a natural gathering spot for family members and visitors alike. It’s been this way as far back as we can contemplate. The cooking stove or the hearth also provided the heat for the home. The kitchen table was used for many activities and for seeing visitors when they came. Even though the way we use and live in our homes has changed over the years, the kitchen remains fairly true to its history. The kitchen is about to come into the spotlight. This week is the beginning of the year-end holidays. Thanksgiving in America is Thursday, and December is one long holiday, with parties, get-togethers, and plenty of baking. With the central focus of the holiday season being the kitchen, it gives us the opportunity as aging in place specialists to evaluate the kitchens of our own homes, those of our clients, and those we may enter in the coming year. Safety is a huge part of the way a kitchen is used, as is their function. There are many moving parts, and it’s easy for some parts to perform much better than others without good planning or an appreciation for what needs to happen. Before looking at lighting flooring, cabinetry, countertops, and other important aspects of the kitchen to help create and ensure proper function, consider some of the many activities that will be occurring – some at the same time. There is going to reaching, bending, grasping, lifting, stooping, squatting, kneeling, and otherwise retrieving packaged goods, baking dishes, pots, pans, skillets, measuring cups, and various other utensils to be used in preparing the food in its various stages and courses. Then, there is going to be the cooking as needed – some long-term like the turkey or other meats, and various other times for casseroles, vegetables, pies, cakes, and other items. This will produce a lot of heat in the kitchen and then some noise as the exhaust fans try to remove some of the heat and steam. Remaining burn-free is important as well as a challenge while inspecting dishes as they are cooking, tasting them for flavor and doneness, and removing them from the cooktop or oven – all the while not touching or bumping into hot surfaces or cooking vessels. Once everything is cooked – even if it comes off or out of the heat at different times – it needs to be placed on plates, bowls, platters, and other serving dishes and containers to be taken to the table or serving area. This is being done while others in the kitchen are still attending to other stages of the overall meal preparation. Cold salads, appetizers, beverages, and condiments need to be removed from the refrigerator and added to the serving areas, the table, or individual place settings. Of course, the table already will have been set unless the meal is being done buffet-style. 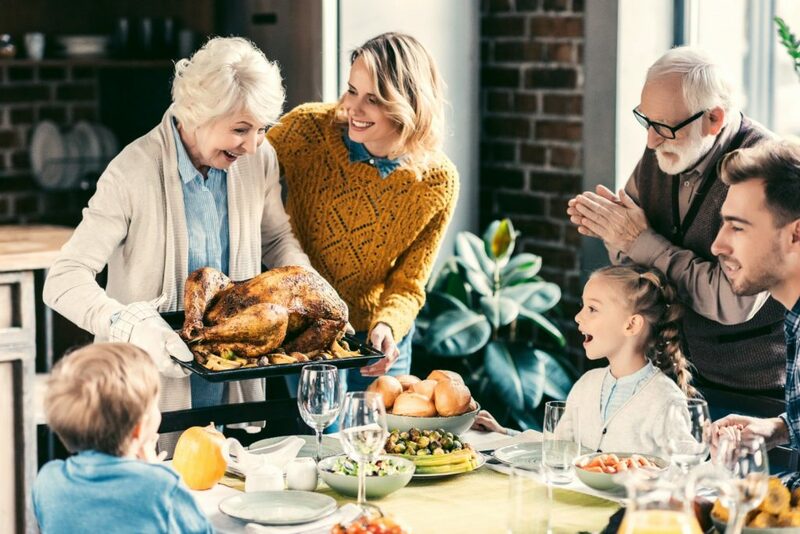 Then, there is the time at the table for eating and enjoying the meal with some people still commuting back and forth from the table to the kitchen to retrieve items from the oven, check on dessert, refresh beverages, or replenish supplies of food already presented. Once the meal is over, the kitchen swings back into full-scale action with the uneaten food that will make classic leftovers needing to be repackaged for that purpose, plates being cleaned off, trash being deposited where it goes, and loading the plates, silverware, glasses, and other utensils in the dishwasher. Each home is going to be different from a very small gathering of just the one or two residents of the home to an extended family and guests. There could be quite the number of people present at any one time in the kitchen watching, visiting, or helping out with the many tasks required to prepare, serve, and clean up after a feast such as this. No one looks forward to anything spoiling all of the joy and good times present at such a time as this, but trips, falls, spills, cuts, and burns are all possible. Dropping objects on our feet, walking into objects (such as table legs or edges or cabinets) is a possibility as well. No One wants anything to spoil the festive atmosphere, so we have to be as proactive as we can to consider what could happen and do all that we can to prevent it. While the kitchen is the main focal point of activity beginning this week and continuing the rest of the year, we have a huge challenge to evaluate safe practices so that we can ward off or eliminate anything that might spoil the good times ahead.